Rough Magic strikes gold again with a hilarious production of Richard Brinsley Sheridan’s 1779 comedy in which they transpose the absurdist action to Georgian Dublin. Peter Daly narrates helpfully at the Culture Box, interrupting dialogue with helpful information for the audience, before stealing the silliest moment of the entire play in The Ark with the infamous silent meditation and preposterously meaningful shake of the head by Puff’s tragic antagonist. Sheridan’s abrupt ending is creatively expanded here with Puff being chased off-stage for criticising his actors and a baffled Dangle and Sneer taking to the vacated floor, reading the opening of Peter Brook’s The Empty Space, dismissing it and then being taken by surprise (much like the audience) by the back wall of the theatre slowly rising to a light show, as the talented young ‘tragedy’ actors from UCD Dramsoc, Trinity Players and the Gaiety School of Acting stand in front of a montage of theatre troupe names and people flock into the square behind to observe – thus proving Brook’s point. The Critic has never been out of repertory of since it premiered in 1779, largely because its well-turned jokes are as fresh as ever. The Critic continues its run at the Culture Box until October 13th. 1975 finds aged British civil servant Henry Carr (Will Irvine) unreliably reminiscing about his time in the British consulate in Zurich in WWI. Carr really did act in a production of The Importance of Being Earnest staged by James Joyce (Ronan Leahy), and they really did get into an absurd lawsuit over a pair of trousers used in the show, but everything else Carr remembers … unreliably. Yes, Lenin (Peter Daly) and Tristan Tzara (Ciaran O’Brien) were in Zurich at the same time promoting Communism and Dadaism respectively. No, they weren’t intimate acquaintances of Carr, and they certainly weren’t all playing parts in a real life Earnest type romantic comedy of mistaken and assumed identities as everyone attempted to woo Joyce’s helper Gwendolyn (Camille Ross) and Lenin’s acolyte Cecily (Jody O’Neill). Carr remembers all this in a series of deliriously repeated scenes as his shellshock and a cuckoo clock restart the action to be ‘accurate’. It’s unnerving to sit thru a comedy where people aren’t laughing, but a delightful wordplay on Bosh and Bosch was just one of many of Stoppard’s hyper-literate gags, most involving Ulysses and Earnest, which proved too smart for the room. The over-emphasis on Joyce in this show’s promotion probably accounts for the air of bemusement that greeted Carr’s dominating presence throughout as Joyce made only comedic cameos. Leahy milked comedy from his role but his accent roved mightily, and unsatisfactorily when it rendered the Clongowes and UCD old boy as a Roddy Doyle character. Irvine was on fine dramatic as well as comedic form, making Carr’s sudden surges of panic about being back on the Western front as important as his foppish obsession with his many stylish trousers that were ruined in the trenches. Jody O’Neill was equally impressive with magnificently clipped delivery as Cecily and superb timing in a scene where Bennett the butler (Philip Judge) beats time in the act of serving tea to Cecily and Gwendolyn as they fight in song lyrics. 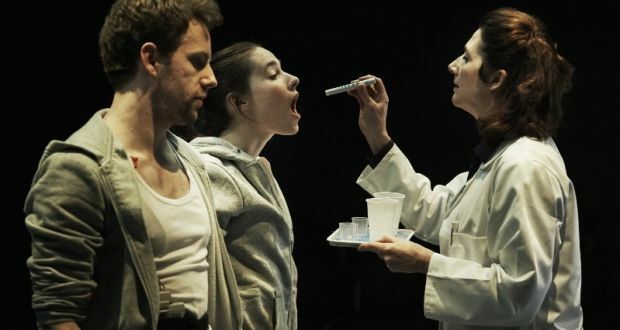 That scene occurs in the second act which houses all the play’s funniest scenes including Joyce quizzing Tzara over Dadaism in the style of the ‘Ithaca’ chapter of Ulysses and giving an impassioned speech on creating Ulysses. Poor old Tzara also gets it in the neck from Carr with a devastating speech that makes a hilarious analogy with redefining the meaning of ‘flying’ to condemn modern art as shifting the goalposts of art to allow talentless people pass themselves off as artists. Art’s purpose is the main theme of a play constructed from other works and daffy showboating like dialogue in limericks. Tzara wants to make art random and democratic, Joyce regards the artist as having a sacred duty to speak truth, and Lenin the revolutionary privately likes his art conservative in form but publicly insists it be engaged in social critique. The momentum killing excessive quotation from Lenin in order to skewer his intellectual dishonesty by his own words seems a very 1970s brush-off to Soviet fellow travellers who attacked Stoppard for lack of political commitment, but Daly generates enormous melancholy from Lenin discovering that his beloved Pushkin, as a ‘bourgeois individualist’, has been supplanted by a futurist poet in curricula. 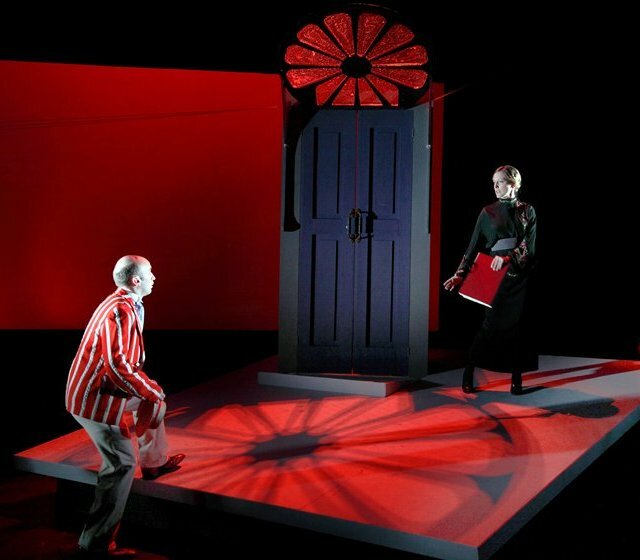 Director Lynne Parker designed the set’s pitched platform which in representing Carr’s home and the Zurich library creates an appropriately surreal atmosphere in which she draws the best from her actors. Stoppard’s plays always dazzle with their bravura mix of wit and learning but this is a solid production of a script that, unlike Arcadia, engages only the head, not the heart. 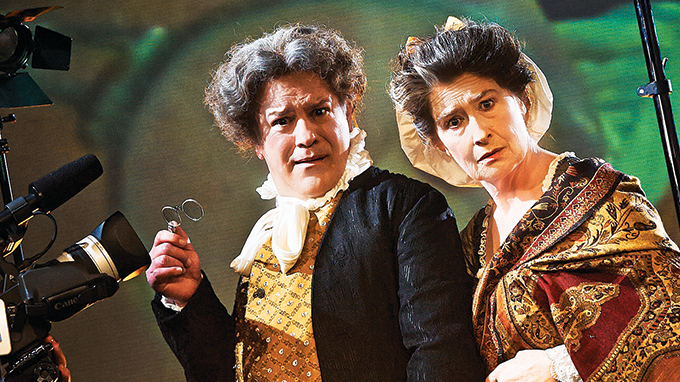 Travesties continues its run in the Pavilion Theatre until June 23rd.